(AP) WASHINGTON - A common class of pesticide is causing problems for honeybees and bumblebees, important species already in trouble, two studies suggest. But the findings don't explain all the reasons behind a long-running bee decline, and other experts found one of the studies less than convincing. The new research suggests the chemicals used in the pesticide - designed to attack the central nervous system of insects - also reduce the weight and number of queens in bumblebee hives. These pesticides also cause honeybees to become disoriented and fail to return to their hives, the researchers concluded. The two studies were published online Thursday in the journal Science. Just last week activists filed a petition with more than a million signatures asking the government to ban the class of pesticides called neonicotinoids. The U.S. Environmental Protection Agency said it is re-evaluating the chemicals and is seeking scientific help. For more than a decade, pollinators of all types have been in decline, mostly because of habitat loss and perhaps some pesticide use. In the past five years, a new mysterious honeybee problem, colony collapse disorder, has further attacked hives. But over the last couple of years, that problem has been observed a bit less, said Jeff Pettis, lead bee researcher at the U.S. Department of Agriculture's lab in Beltsville, Md. Other studies have also found problems with the pesticide class singled out in the new research. These "strengthen the case for more thorough re-assessing," said University of Illinois entomology professor May Berenbaum, who wasn't involved in the new studies. "But this is not a slam-dunk indictment that could compel a ban. It's complicated." In the honeybee study, French scientists glued tiny radio transmitters to the bees managed for orchard pollination. The bees were tracked when they came and left the hive. The bees that were dosed with neonicotinoids were two to three times more likely not to return. In the bumblebee study, British researchers dosed bees with the pesticide and moved their hives out into the field. After six weeks, they found the pesticide-treated hives were 10 percent lighter than those that weren't treated. And more important, the hives that had pesticides lost about 85 percent of their queens. Bayer Crop Sciences, which is the leading producer of this type of pesticide, says it is used on 90 percent of the corn grown in the U.S. and is safe. Bayer eco-toxicologist David Fischer said the honeybee study used unrealistically high doses of the chemicals, amounts that would not be used on crops bees normally pollinate. Berenbaum, Pettis and a third outside scientist said the bumblebee study was a more convincing study than the honeybee research because it used lower doses and didn't make as many assumptions. 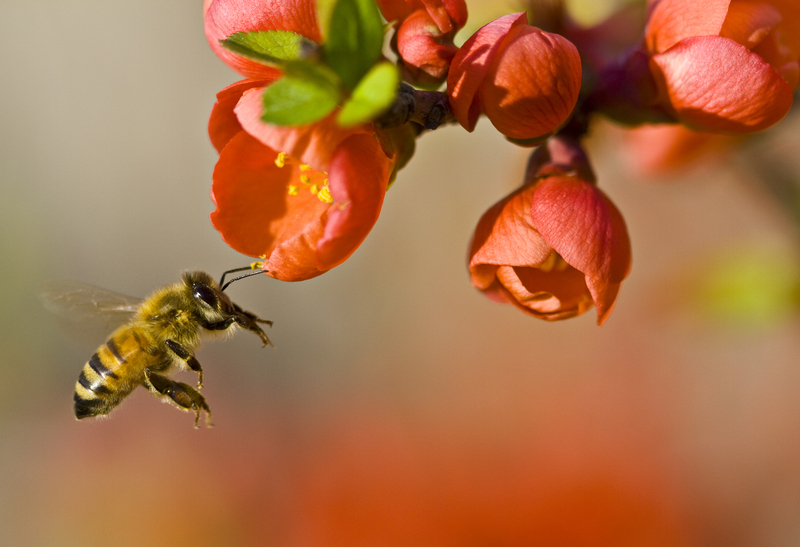 Bees are needed to pollinate fruit, vegetables and nuts. Without them experts say our diets would be very bland. Honeybees, which aren't native to America, are managed by professional beekeepers, carted from farm to orchard and raised to produce honey. Bumblebees, native to this country, are wild pollinators.